When a mysterious stranger, Vianne Rocher, arrives in the French village of Lansquenet with her daughter and opens an exotic chocolate boutique directly opposite the church, Father Reynaud denounces her as a serious moral danger to his flock - especially as it is the beginning of Lent, the traditional season of self-denial. 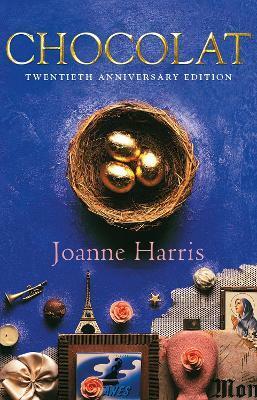 Chocolat was Joanne Harris' first book about Vianne Rocher,and was turned into a popular Oscar-nominated film with Juliette Binoche and Johnny Depp. The story of Vianne and her daughters was continued in Lollipop Shoes, and then in Peaches for Monsieur le Cure, and now in her new novel, The Strawberry Thief. "Mouthwatering ... a feelgood book of the first order ... your senses are left reeling. Read it" Observer "Is this the best book ever written? Truly excellent ... Harris's achievement is not only in her story, in her insight and humour and the wonderful picture of small-town life in rural France, but also in her writing" Literary Review "Sensuous and thought-provoking ... subtle and brilliant" Daily Telegraph "A celebration of pleasure, of love, of tolerance" Observer "An addictive read ... haunting, obsessive and just a little nutty, like a freshly made praline" -- Elisabeth Luard, author of "Family Life"